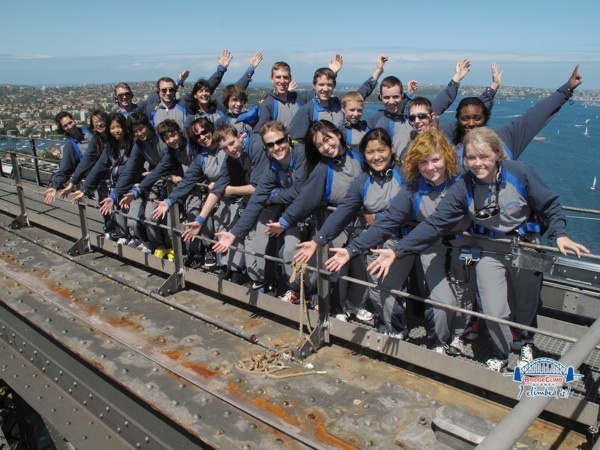 THINK students doing the Sydney Bridge Climb. Photos courtesy of THINK Global School. It’s 5:30 AM my time, 9:30 PM their time, when I connect with the students of THINK Global School via Skype. I’m in New York, where it’s cold and snowy. They’re in Sydney, where it’s been unseasonably warm. I rub the sleep from my eyes, take a sip of coffee, look for a pen, and tell them I’m not going to turn on my video; I’m still in my pajamas. I can see them, though; they’re in t-shirts and shorts, most of them barefoot or in socks. They’re sitting on couches, chairs, the floor, some of them with their arms draped around each other like they’ve been friends for years, even though they’ve only known each other since September 2010, which is when THINK Global School (TGS) inaugurated its first class. As I quickly learn, the exceptional closeness of the students is only one of the many characteristics that distinguish TGS and its model of education from any school I’ve attended or known. Another is how willing and excited all the students are to have a conversation. When I ask them a question, there’s none of the typical adolescent reluctance to speak. All of them have answers and opinions, and they articulate them thoughtfully. 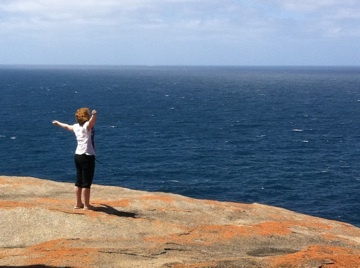 Megan, a student from New Zealand, attributes this openness to the school itself. “We’re able to think our own way,” she says. While most of the students say that they enjoyed school before they became TGS’ inaugural student body, their love of learning has become amplified by being immersed in the TGS model. McPike considered several alternatives, including hiring a private tutor who could travel with the family, but then a much more ambitious and inclusive idea occurred to her: Why not start her own school, one that would welcome students from any country, one whose classroom would be completely mobile? Many of the students had traveled extensively prior to their enrollment and some had lived outside their home countries. But none of them thought the world might actually be their classroom prior to becoming students at TGS. “I never thought a traveling school was possible,” says Mark, who is originally from Russia. The students in this inaugural class will have traveled to three cities in three different countries by the end of this school year. The 2010-2011 term started in Stockholm. Students are currently in Sydney, and by year’s end, they’ll be in Beijing. In each location, TGS partners with local schools and scholars, as well as members of the community, to provide its students with hands-on opportunities for learning. ““By being in the world, you get closer to it,” says Alex, one of the TGS students. If the anecdotal feedback of the students is any indication (and for me, at least, it’s at least as valuable as the test scores schools place so much importance on here in the States), the mission of THINK Global School is being fulfilled. The students agreed that while they have all made some sacrifices–being separated from their families for an extended period of time, giving up some extracurricular activities they might have had at home, and learning to live with others were some they mentioned– the trade-offs have been well-worth it. Seeing the world with their own eyes, overcoming fears, and learning how to apply the knowledge they acquire in meaningful, practical ways have made them more confident and engaged learners, and more empathic, interested members of the world community. The school will be adding a second class of students in the 2011-2012 school year, and applications are currently being accepted. International flights, instruction, and the technology the school relies on to help deliver lessons and help share its findings with the world aren’t cheap, but the school has a generous scholarship program to support students’ annual fees. For more information about THINK Global School, please visit their website. Students share their experiences on the school’s blog, and TGS is active on Twitter, Facebook, and Flickr. What other innovative schools or educational programs do you know of that support global education? Share your ideas in the comments.